Honoured: The 2017 Community Leader Award winners Annette Baker, Henry Smerdon, Stephanie Santos, Michael Curtin and Sr Elvera Sesta. Photos: Alan Edgecomb and Emilie Ng. HOMELESS people across the Sunshine Coast will have a new reason to cheer for their biggest supporter, Nambour Catholic woman Annette Baker. The Nambour parishioner and member of the St Vincent de Paul Society for 17 years was named Community Leader of the Year in Brisbane last week. Mrs Baker received the award for her contribution to Vinnies in Queensland and in particular her life-changing work for homeless people on the Sunshine Coast. As a former president of Vinnies’ Northern Diocesan Central Council, Mrs Baker led the development of the MacKillop Village, a 42-unit safe haven for people who were homeless or at risk of homelessness. She also worked with the Queensland Government to turn an unused motel into accommodation for people suffering from mental health issues. As a board member of Vinnies Housing, Mrs Baker is constantly looking for land that can be developed for affordable accommodation for people on the Sunshine Coast who are homeless. The humble mother and wife said the most rewarding part of volunteering for the society was the chance to “turn tears into a smile”. She said being recognised as the 2017 Community Leader of the Year was a positive win for the St Vincent de Paul Society. “When I thought about it, I saw it as a recognition of the work done by the St Vincent de Paul Society, which mostly goes unnoticed,” Mrs Baker said. Fellow Vinnies member John McMahon said Mrs Baker’s contribution to the society in Queensland was “legendary”. “I have served on numerous committees with Annette and she is unflappable,” Mr McMahon said. 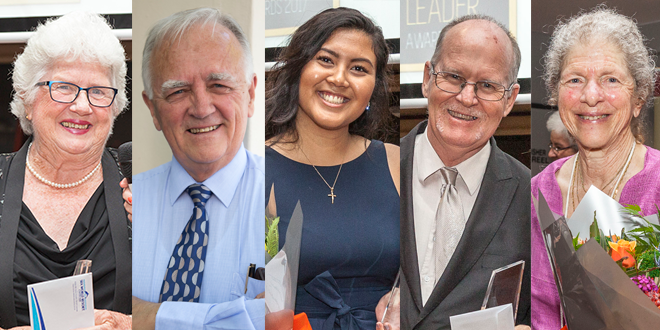 Mrs Baker, who took the night’s top award, joined four other Catholic winners from Queensland named as finalists for the Community Leader Awards. Gold Coast deanery youth worker Stephanie Santos received the award for Young Leader of the Year for her work in developing youth groups across the Gold Coast. The former Surfers Paradise youth co-ordinator recognised the lack of Catholic youth groups across the Gold Coast region and submitted a proposal to grow youth ministry in the South Coast Deanery. Griffith University chancellor Henry Smerdon took out the Professional Leader of the Year award for his dedication to the future and welfare of students. School Leader of the Year went to long-time servant of St Rita’s College, Clayfield, Sr Elvera Sesta, who has been with the community since she was eight years old. The Presentation Sister is a former principal of St Rita’s College and, continuing to teach there, inspires students and staff. Michael Curtin received the award for Volunteer of the Year for his significant contributions to Courage, Real Talk Australia and Blind Eye Ministries. Mr Curtin, who was diagnosed with schizophrenia at 23, began to volunteer for Church ministries after retiring early from the public service. The Catholic Leader managing editor Matt Emerick said the five award winners were examples of humble people who, inspired by their Catholic faith, had reached out to support their brothers and sisters in Christ. “Each of the award recipients chose to contribute to their community after experiencing an encounter with the Catholic Church,” Mr Emerick said. Brisbane Archbishop Mark Coleridge said the Community Leader Awards showcased “models of leadership” underscored by service. “You are someone who is genuinely concerned to serve,” Archbishop Coleridge said. “We will never ever begin to understand leadership in a Catholic or indeed a Christian setting unless we see servant wherever you see leader. “So what we are presenting here now is really the Community Servant Award. The Community Leader Awards are a national initiative of The Catholic Leader and was established in 2014 to honour Catholics serving the community. Nominations for the next Community Leader Awards will open in 2019. Read the official magazine for the Community Leader Awards 2017 here.